Hello all and Happy Friday. I recently visited a large Farmer's Market in San Jose Costa Rica and was able to sample some fruits and vegetables that I have never seen or heard of before. Today I will share some of my new discoveries with you. Upon first entering the market I spotted some colorful yellowish orange vegetables that were already cooked and ready to eat. These are called Pejibaye which are a palm tree fruit. While they are a fruit they taste more like a cross between a squash and a walnut. They are often sold already cooked and are excellent with mayonnaise. The next vegetable I encountered is called chayote and it is a member of the gourd/squash family. Chayote is very popular in Central America and is often lightly cooked or served raw with salads. While it does not have much flavor, it is a very good source of amino acids and vitamin C.
I couldn't help but notice that there were many stands with squash that looked like a giant zuchini. I first identified this as a zapallo squash but with a little research discovered they are actually called Costata Romanescu Squash. Although this is not an exotic squash, it does require a long growing season making Central America ideal for cultivation. 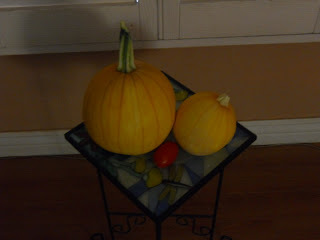 It originates from Italy and is considered one of the best tasting squashes. This squash will also grow well in the Southern USA. I spotted another root vegetable that looked like horseradish. I learned that this was not horseradish but was called yuca(not to be confused with yucca), and that it would be one of the ingredients used in Sundays dinner of Baho, a traditional Nicaraguan dish of marinated beef, plaintains, and yuca steamed in a banana leaf. (I'll share this recipe with you in the next blog) Yuca is not really a vegetable but is the root of the Cassava shrub instead. Yuca tastes much like potatos, are very starchy, and are rich in calcium, phosphorus, and vitamin C.
One of the most unusual fruits I saw are called Mamon Chino. Mamon chino looks like a cross between a Sea Urchin and a koosh-ball. They are native to South-East Asia but are grown in abundance in Costa Rica. They have a large seed in the middle and contain mostly a pulpy juice much like a pomegranate. 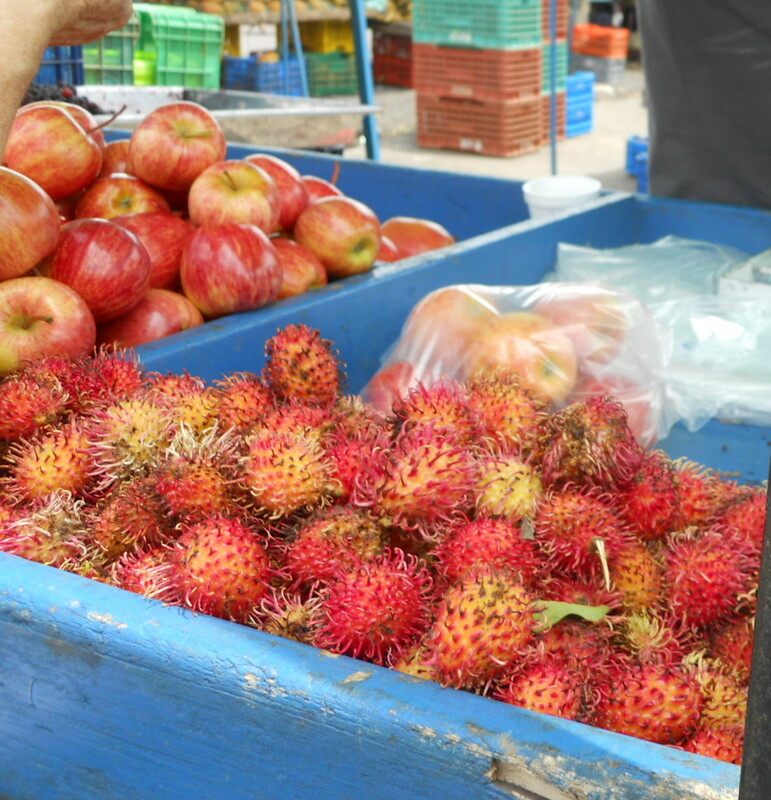 They taste like sour strawberries and are very popular in Costa Rica. One last exotic I want to share about today is called Carambola or Star Fruit. and these area also very popular in Central America. 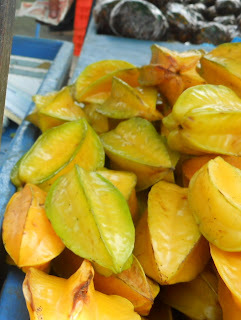 Carambola are among the tastiest of fruits and make a sweet delicious juice that tastes like papaya, orange and grapefruit. Carabola is rich in antioxidants and vitamin C and although sweet, is actually low in sugar. Well I guess late is better than never and so here I am on Wednesday with my Tuesday blog post. I try to be regular with my posts but this week I have a great excuse for being late, I’m packing for paradise, aka Costa Rica. I am very excited to be have the opportunity to get lots of new tropical gardening material for my blog and website but that’s not what I want to talk about today, I want to talk about pumpkins. I know what everyone’s thinking, It’s not pumpkin season yet! Heck, Halloween is almost four months away and pumpkin pies really aren’t appropriate until Thanksgiving. So why am I writing about pumpkins now? Because my good friend and follower, Jeanne Wickwire-Upton just harvested two of the golden orbs last week…in Arizona…in July and I have a picture to prove it. With Temperatures near the 115 degree mark Jeanne thought it would be a good idea to bring them indoors before they became pumpkin pie. Now Jeanne is an excellent cook and they may very well become pie, but pie is better baked in the oven, not on the vine. While we were on the subject of pumpkins, Jeanne mentioned something interesting about pumpkins that I had forgotten about, that they were often grown in or near cornfields. This in turned brought back memories; I remembered going with my grandmother to pick pumpkins and they were always planted next to a corn patch. I recalled this being quite common, but I didn’t know why and until just the other day was not interested. However, when Jeanne mentioned it, my curiosity was peaked and I decided to do a little research. After about an hour or two of uncovering some very interesting facts about pumpkin, I came up with what seemed to be the most logical answer; pumpkins were and still are often planted near cornfields because first off the vines like to crawl about the rows thereby being neatly trained. Secondly, the pumpkin vines help to keep the weeds down and the shade of their leaves helps the soil retain moisture. So the two become biological allies and are mutually dependent on each other. Weed control without herbicide and nice orderly rows of pumpkins. Well that wraps up tonight’s little post but the good news is that I have uncovered a whole wealth of interesting new info about pumpkins to share, and about why they are such a beneficial crop to grow, especially for beginning gardeners so look forward to a few very interesting pumpkin-posts ahead. Until tomorrow, Happy Gardening. Hello and Happy Thursday to you. I am happy to report that all is well in our little herb garden and that we have had several new appearances since Tuesday. As of Wednesday night we have three new paprika sprouts and they look very healthy. I have always joked that paprika is my favorite spice. I think that came from a line in Tom Hank’s movie, Bachelor Party , when he says something to the effect of everybody’s favorite spice “Paprika” I have to watch the movie again to be sure but I have to admit, I have always loved the way it beautifies a potato salad. Aside from that, it didn’t really do much for me because the stuff I bought in the little jars pretty much had no flavor. Well I am here to tell you I have learned a great deal since Dave first told me he needed a local paprika grower. First off, what I did not know is that paprika is actually a chili-pepper that has its origins in Eastern Europe, primarily Hungary. There are over 30 varieties of paprika peppers ranging in taste from sweet and mild to mildly hot. As a rule, red paprika peppers are mild and brown ones are hot. Paprika has a reputation for being bland but that is because in the USA we use it as a garnish and it takes mild heat to bring out the flavor in paprika. The best way to use it, I have learned, is to add it to a few minutes before a dish is finished cooking at low heat. Too high of heat will kill the flavor but 5 minutes at low temperature will do wonders for any dish. That is one reason my friend Dave wants to use it in his rib rub, it really enhances the flavor and there is nothing that compares to homegrown paprika. Paprika peppers are relatively easy to grow and are a great herb for a beginning gardener to grow. They need moist, well drained soil and seem to do well between 75 and 85 degrees. Because it is so hot here in Arizona I will opt to grow them indoors in containers and with the humidity being so low here, I am considering buying a small portable greenhouse to keep my herbs from drying out. These are relatively easy to build using PVC pipe and plastic sheeting, but for less than $50.00 I can buy one at the local garden center or online. The ones I have looked at are about the size of a small bookshelf which works well in my condo (See links below). If there isn’t enough light a few grow lights will solve the problem. I plan on buying some of these very soon. The other benefit to using a portable greenhouse for my paprika plants is it really cuts down on watering. I will be ordering one of these after I sign-off because I have some very nice looking sprouts that are going to need transplanting soon. Well, that wraps up another edition of tending the garden. I hope I have been able to pass along some useful information and please, if you have questions about anything I have written about or you have some useful information to share, please leave a comment. I will be glad to share it in my blog.